Listening to Apple’s announcements today was a little bit like tuning into a Ronco commercial: But wait, there’s more! 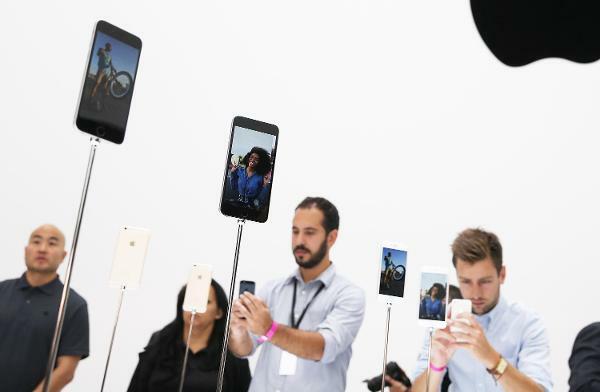 CEO Tim Cook revealed the iPhone 6 and 6 Plus (available Sept. 19), the mobile payment technology Apple Pay (a software update coming in October), and the Apple Watch (due out sometime in 2015). So which of these really resonated with the rubberneckers? 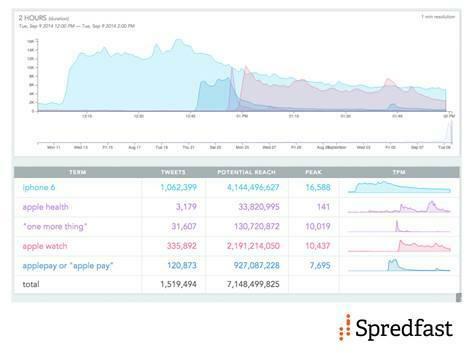 According to social marketing company Spredfast, the new iPhones (in regular and plus size) swamped the tweets with 1 million-plus mentions. No surprise, but people gushed most about the size and then the camera upgrades. 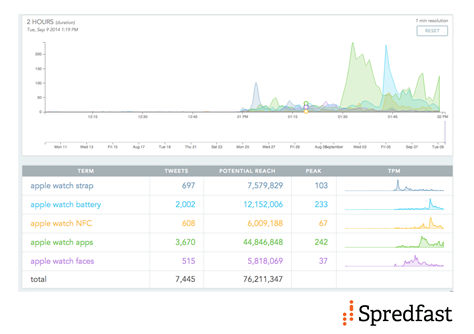 The Apple Watch, despite being a game-changer for the company, got a relatively subdued 336,000 mentions right before and after its unveiling. While the fancy array of straps and watch faces definitely got attention, people wondered about the battery life — which wasn’t mentioned during the presentation. 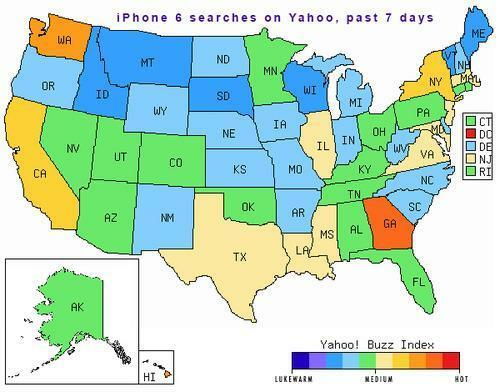 While Cook didn’t bat an “i,” people keep slipping into the habit of calling the latest product the “Apple iWatch” on Yahoo Search. Searches on the watch focused on the price (which starts at $349), release date (not for a while), specs, and images. 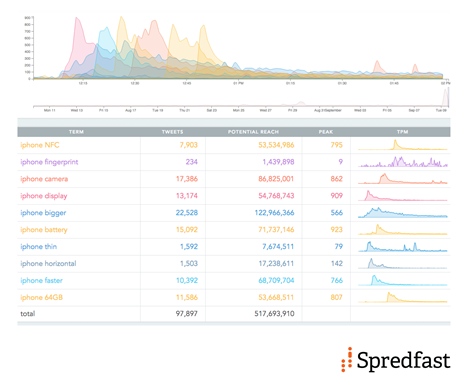 By the way, presentation is everything, and that includes the announcement itself: A stuttering livestream, which could be seen only on Safari, earned a fair amount of ridicule on Twitter. 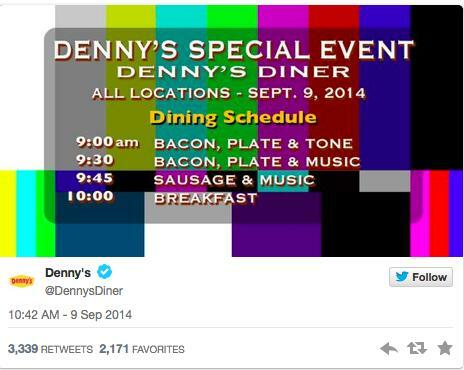 Even food chain Denny’s stuck a fork in Apple’s eye. 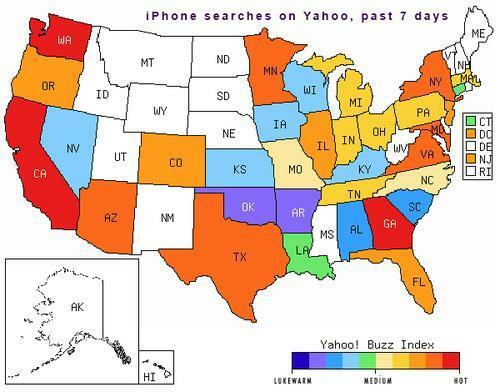 As for who might be buying, searches on Yahoo for “iphone 6” have been 41 percent female/59 percent male. Atlanta leads the regional searches for the latest model, followed by Honolulu, Seattle-Tacoma, Miami-Fort Lauderdale, and Los Angeles. Don’t forget the bargain hunters: Searches for “iphone 5s” alone ratcheted up nearly 6,000 percent in the past seven days — and now the frugal are rewarded with $99 pricing.